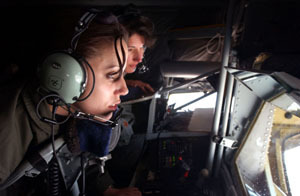 OPERATION IRAQI FREEDOM -- Airman Edel Brooks (left), a boom operator, and Col. Cathy Clothier watch a receiver aircraft take on fuel from their KC-135 Stratotanker during a recent sortie from a forward-operating base. Both Brooks and Clothier, deployed from the 319th Air Refueling Wing at Grand Forks Air Force Base, N.D., are assigned to the 401st Air Expeditionary Wing supporting operations for the war on terrorism. OPERATION IRAQI FREEDOM (AFPN) -- While most people were waking up and drinking their first cups of coffee, the first of several KC-135 Stratotanker aircrews from the 401st Air Expeditionary Wing launched combat support missions from their deployed location March 19. "It was definitely a team effort all the way around today," said Col. Cathy Clothier, an aircraft commander and commander for the tanker operations here. From the initial aircrew intelligence briefing to the actual air refueling operation, Clothier said the mood of everyone involved was focused. "(On March 18) I briefed all of our aircrew about the upcoming operations and told them what we are about to do in the next few days will change history. Not a single bomb gets dropped, not a single air-to-air engagement happens or missile is fired unless tankers make it happen," said Clothier. "I'm proud of our people here and I'm excited to be a part of this." Capt. Brian Mackey and 1st Lt. Ryan Budinko flew with Clothier. Both said the mission was one of the most exciting they have flown. "I have deployed several times, and flown in both operations Northern and Southern Watch," Mackey said. "But the atmosphere was different on this mission ... because of our aircrew and the range of experience from Clothier all the way down to Airman (Edel) Brooks, who flew on her first combat support mission." Brooks, a 20-year-old boom operator, has been in the Air Force for more than a year. On this mission, she was responsible for transferring 60,000 pounds of fuel to four heavily armed coalition aircraft. "It was great," said Brooks. "I always get excited about flying, and today was really amazing. The day I stop getting excited about what I'm doing is the day I need to think about doing something else." Not only aircrew members take pride in flying combat missions. On March 18, production supervisors got together to decide which aircraft was the most reliable to fly the first sortie, and which crew chief deserved the recognition of having his jet take off first. The KC-135 chosen for first-mission honors is the charge of Staff Sgt. Ben Bugza. When told that his aircraft would fly the first combat mission, Bugza had only one word to describe it: "Wow! "I was really stoked about the decision," he said. "It's nice to see that people notice what we do, and it feels rewarding beyond any letters or papers that we might receive. Staff Sergeant Tony Contreras, Airman First Class Sean Browne and I all work on the aircraft and it was an honor for all of us," said Buzga. "It was a unanimous decision," said Senior Master Sgt. Jesse Paul, a senior maintenance supervisor for the KC-135 fleet. "(Bugza's aircraft) has one of the best performance records and (he) has really worked hard and shown a real interest in what he's doing. We can't give them pay raises but we can give them honors." The task of the tanker crews in the days ahead is familiar. "Our mission doesn't change in peacetime or wartime," said Mackey. "We do this every time we fly. Although there might be more coordination during combat missions, we train like we fight and we're ready for anything that comes our way."